A will is a document that directs the disposal of your property after your demise. It is relatively simple to make a will in India, but it is better you consult the services of an experienced advocate or agency like advocateinchandigarh.com. The person making the will is called the testator and the beneficiary as legatee. Further, a person who implements the will is called as executor and those who vouch for the veracity of the bill- as witnesses. A will can be made on any paper, in the testator’s or any other handwriting and requires the signs and address of two witnesses. Normally, there is no reason to register the will or notarize it. But when you are worried about the safety of the bill or want to bequeath property to a charitable organization, registering the will is a good idea. One can take the help of advocateinchandigarh.com to register your will. This is, especially, true in case your will is contested by potential heirs in a court of law. The will must be simple, clear and concise. We help you draft the will with no ambiguity so that after your demise, it is not subject to misinterpretation. It is imperative that you and the witnesses sign on every page of the will and page numbers are noted at the end of the will. This again is to prevent any chances of fraud if someone tries to insert pages into the will. The will must be kept safely in a vault and copies with us, your advocate. The legatees and the executor must be informed where the will is kept. A will must be dated so that a fresh will negates all previous wills. A testator is allowed to make as many changes to his will during his lifetime. We can help you create a codicil- an appendage to the will indicating any changes in clauses. Or we can help you draft a completely new will if there are too many changes. It is better you make your will when you are young as it prevents heirs to contest the will saying that you were old and senile while making your last will and testament. The permission of the executor must be taken before he is vested with the responsibility. 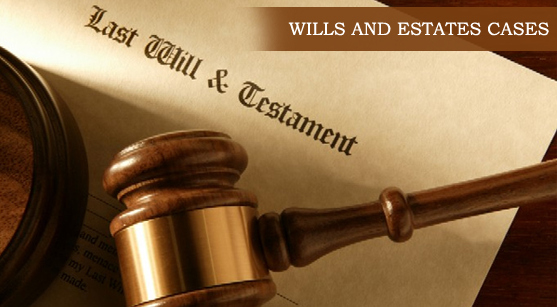 A will does not need legal language, but for the foresight, the service of advocateinchandigarh.com will help you face contingencies like contesting of the will. We have the experience and expertise in help creating wills, provide advice on wills, and if it happens, to fight the case of contesting a will. You can make a will with the help of advocateinchandigarh.com. Print copies of your will; sign it by yourself and two witnesses on every page. Now keep a copy with yourself and another copy with us. Though not necessary, you can register a will to prevent it being contested by fraudulent persons. We also advise you on naming alternative legatees in case you meet with death at the same time. You can keep your will confidential. We promise top privacy. Not even your witnesses need to view the contents of your will.